…because if they are not accurate then we are screwed! Testing my blood sugars gives me a window into my health. It gives me an empirical/numerical value in which I can judge, and over time the blood sugar values can ultimately tell me how healthy I have been. Now certainly a high blood sugar every once in a while is nothing to stress about but it is still something I take note of and try to figure out what I did to make it high so I can log it into my mental diabetes database. I essentially like to keep track of a rough A1C day to day (CGM is wonderful for this). So of course having accurate testing devices is super important for me to have an accurate picture of my health. One of the main things that frightens me is the knowledge that at some point in my life I could go blind or lose some fingers/toes or, hell, even lose a limb all because of diabetes. This really scares me. And because of this fear I try to always have complete control of my blood sugars. Its actually weird that high blood sugars upset me more then low blood sugars which are immediately dangerous. So having accurate test strips and glucose meters are crucial for me to know that I won’t have serious health complications due to diabetes or can at least prolong the diabetic health complications until I am way old and have health problems any way. Since my diagnosis I have been using diabetes as a tool to live a more healthy life. Its my way of “looking on the bright side” of having diabetes. Pre-diagmonsis: I was very unhealthy. Never working out, eating too much crap, smoking cigarettes, and drinking too much too often; pretty much just being a stereotypical college guy. Post-diagnosis: I work out every other day, I heavily limit my sugar/carb intake, I don’t smoke, I rarely drink (and even more rarely over indulge); basically a complete 360 from where I was. And because I believe that my blood sugar testing equipment is accurate (or as accurate as possible) I know that the effort into being more healthy and controlling my blood sugars is not in vain. So a simple answer to the original question: Test strip accuracy is important to me because I want to stay healthy. Pioneering insulin cell transplants helping type 1 diabetics with debilitating hypos. 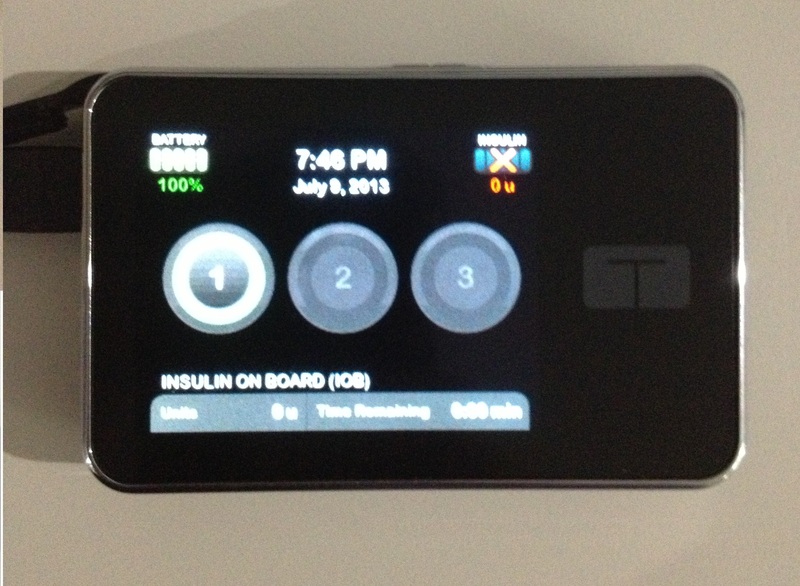 Recently I have acquired an insulin pump (Tandem T:slim) and it has made managing my diabetes so much easier. I essentially have insulin-on-demand now and no longer have to carry so many “diabetic supplies” such as my insulin pens (Humalog and Lantus) and extra pen needles. You no longer need to have two different types of insulin with a pump (fast acting and long acting) because you use fast acting insulin to compensate for the long acting insulin. It really has given me more control over my diabetes, therefore giving me more control over my life. I highly recommend any one who does not use an insulin pump to seriously consider getting one. Granted, they are not for every one but all I ask is you do not automatically rule it out. About a week ago my new t:slim pump arrived and I am absolutely loving it. Like I said it has really changed how I manage my diabetes. The t:slim has so many great features that really make it stand out and truly makes it a great pump. Another great feature of the t:slim is the color touch screen. The color screen makes the pump much more pleasant to look at while the touch screen makes it very user friendly. “But what if you accidentally hit the screen and administer a bolus to kill all other boluses?” Good question! The pump has a lock screen which you have to tap buttons in a sequential order to unlock, so it is nearly impossible that you will pocket bolus. On the screen itself, it displays graphics in the corners to let you know exactly how much battery life you have and how much insulin is left in the reservoir. Along the bottom of the screen, the pump shows you the Insulin on Board (IOB: the insulin still in your system) and well as the time remaining until the insulin is no longer in your system. This really gives you a good idea how much insulin to take and keeps you from “stacking” your insulin which can often lead to a low blood sugar disaster. The pump also has some unique features when it comes managing and using your insulin. You can set your basal rate down to the third decimal place. Mine right now (I am still fiddling with the numbers a little bit) is .487, which means that every hour I receive .487 units for a total of 11.7 units over 24 hours. The three decimal places really gives you a lot of control over your basal rates and provides greater accuracy when setting your rates. You can also setup temporary basal rates for times when you are sick/stressed, have low/high blood sugars, disconnecting for a couple hours, or anything that requires an altered basal rate. In the course of making a profile (which stores all your info) you will input values for your insulin to carb ratio, a correction factor, and your ideal blood sugar level. The insulin to carb ratio means 1 unit of insulin counteracts X grams of carbs. The correction factor is a ratio that represents 1 unit of insulin lowers your blood sugar X mg/dL. When administering a bolus, the pump takes into account your current blood sugar level, the amount of carbs you are about to eat, the IOB, the correction factor, and the carb ratio to give you a projection/recommendation for a bolus amount to keep you at your target blood sugar level. Of course you can manually change the recommendation if you feel it is too much/not enough insulin. The pump also has a quick bolus feature which allows you set a desired insulin amount and can administer it with the touch of a button. You can also extend a bolus meaning you can administer X% of a bolus now and X% at a later time which is good for long periods of snacking or maybe even pizza. This is just a brief overview of the Tandem t:slim’s more unique features. If you want to find out more about this pump you can check YouTube for more videos and you can also check out there website here. As I mentioned before the pump has been life changing and seriously recommend people to check out the t:slim and insulin pumps in general.